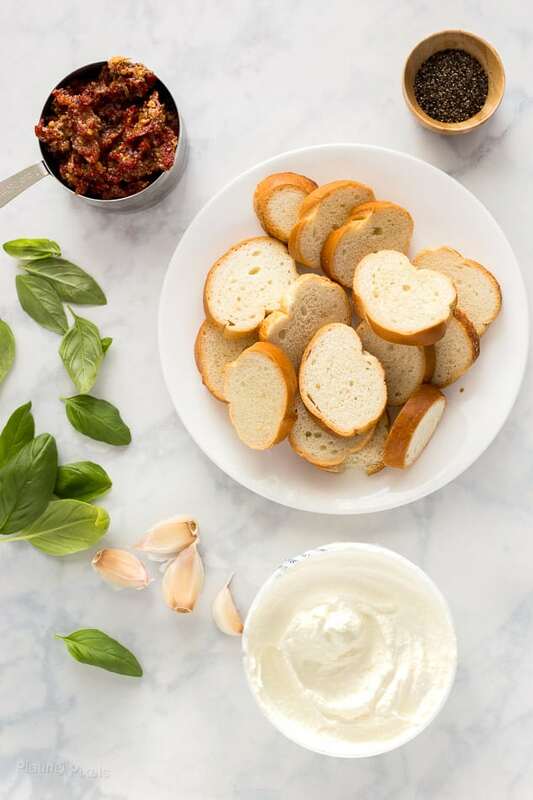 A quick Sun-dried Tomato Ricotta Crostini appetizer recipe, made with sun-dried tomatoes, basil, garlic, pepper, and ricotta served over crispy crostini pieces. These little bites are packed with flavor and make a great speedy snack, light lunch or appetizer. Recently I started reading a book called Flavor. Just a few pages in, it seems to be an intriguing look at how our perception of taste works, and how we can use that to our advantage to appreciate food. 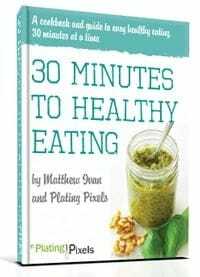 It also goes into how you can use this knowledge to improve your cooking and culinary creativity. Now that’s my type of reading. One thing it mentioned early on is how certain ingredients and taste profiles can enhance the flavors of other foods. 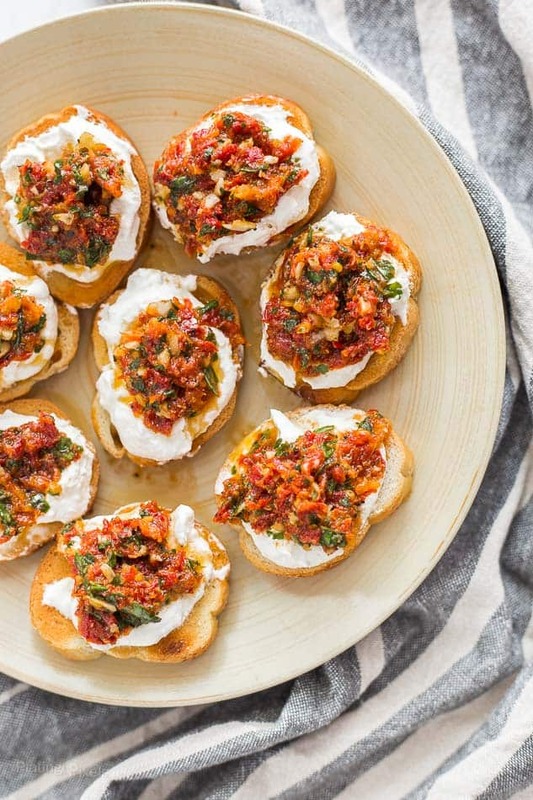 This Sun-dried Tomato Ricotta Crostini recipe highlights that fact with a perfect pairing. Plus it’s ready and minutes and a perfect salty, savory and cheesy addition to your party appetizer menu. Sun-dried tomatoes: When tomatoes are dried their flavor intensifies and concentrates. The salty, deep flavor works perfectly with the light, creamy ricotta cheese. Fresh Basil: Make sure to use fresh basil as it’s much more flavorful and fragrant than dried. Garlic: Don’t substitute with garlic powder. You want a fresh, pungent garlic hit (it makes all the difference). Ricotta: Creamy and fresh it balances out the other bold flavors. Crostini pieces: Crispy and light. You could also use crusty bread cut into slices and lightly toasted. What is the difference between crostini and bruschetta? 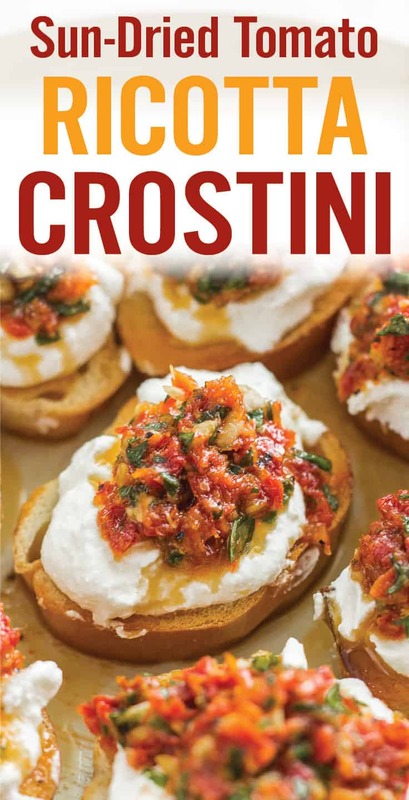 Crostini and bruschetta are both of Italian origin and both consist of toasted bread topped with a savory topping the main difference between them is the bread used. Bruschetta is usually made with charred bread since it comes from the Italian word Bruscare (to roast over hot coals) whereas crostini (which means little toasts) is typically served with a smaller round sliced bread similar to a baguette. Start with drained oil-packed sun-dried tomatoes. Blend with fresh basil leaves and garlic in a food processor to create the rich and colorful topping. Place over soft, creamy ricotta atop crunchy crostini bread. The combination of texture makes these bite-sized Sun-dried Tomato Ricotta Crostini even more unique. Pro tip: Make sure you use sun-dried tomatoes packed in oil, as they will help bind everything together and create the proper consistency. Use store-bought crostini to make this recipe easy. Plus they’re a perfect size and have a great crunch. However, you could also use toasted sliced French bread. Normally cheese is paired with wine, and this works well for this Sun-dried Tomato Ricotta Crostini. For a unique twist, I suggest your favorite cold beer. One with a bit of boldness or hoppiness. Have you ever wondered why peanuts or other salty snacks are often served with beer? Besides the satiety factor, saltiness covers the bitter undertone that’s common in beer. Bitterness isn’t a bad thing, and one of the things that makes beer what it is. However, the salt helps bring out all the other flavors in the beer, similar to how you’d pair cheese and wine. Flavor profiles: Rich, savory and umami flavors. Texture: Creamy ricotta and tomato spread over crispy crostini. 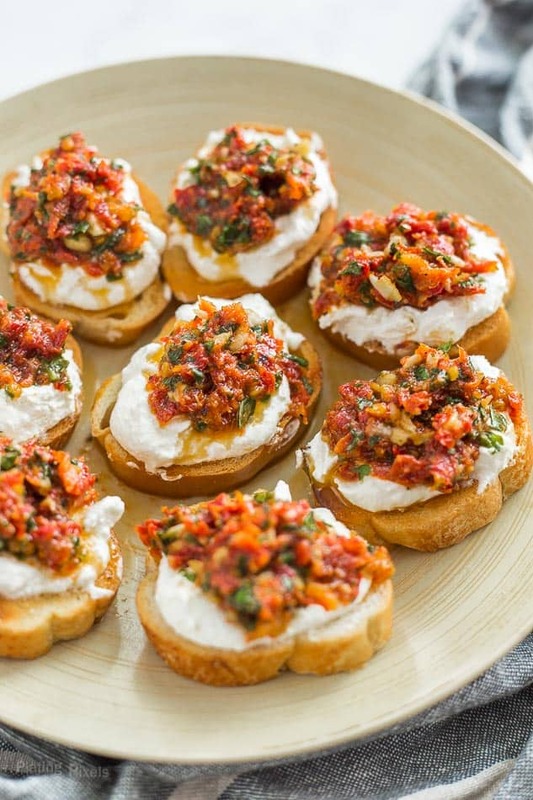 Sun-dried tomato, basil, garlic, pepper and ricotta over crispy crostini pieces. 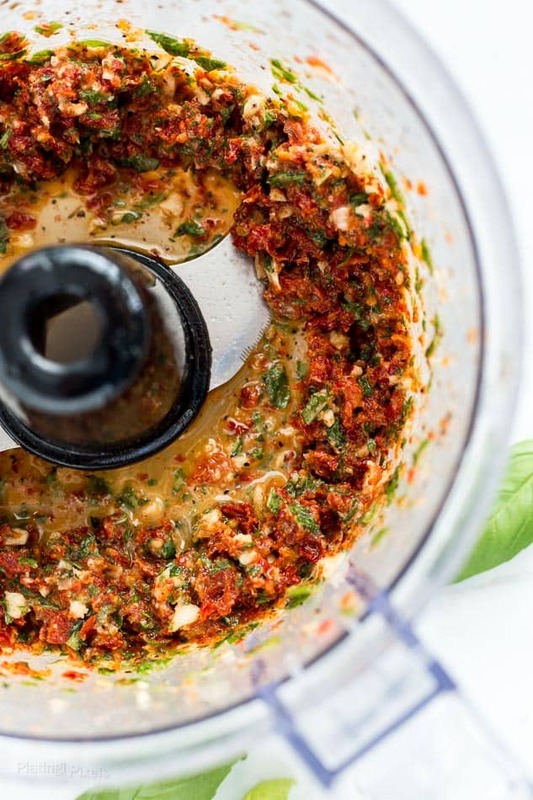 Place sun-dried tomatoes, basil, garlic, salt and pepper in a food processor. Pulse until combined, about 15 seconds. Spread ricotta evenly over crostini pieces and top with sun-dried tomato mixture before serving. Use store-bought crostini to make this recipe easy. Plus they're the perfect size and have a great crunch. However, you could also use toasted sliced French bread. Just made this. 1 recommendation. It is better to chop the basil somewhat BEFORE adding it to oil soaked sun dried toms. Once oily, the basil won’t chop as fine. A very minor improvement to an easy and impressive recipe! Thanks for the feedback Penelope. The instructions recommend blending it all together in a food processor, so pre-chopping first isn’t needed. If you don’t have a food processor, then that’s a great alternative. I’m excited for spring as well! Thanks Penelope. I love everything about this! Easy, delicious flavors, and so pretty. Can’t wait to make this! You are speaking my language! I’m ricotta obsessed so this looks perfect! Thanks for sharing! Haha glad you agree. Thanks Liz! I can practically taste the fresh basil just from looking at your pics- this crostini looks delicious and perfect for entertaining. I love that you suggested a beer pairing with this crostini, it’s unexpected (in a good way) but actually makes a lot of sense! I love quick and easy party food like this. Perfect for when people turn up unexpected.